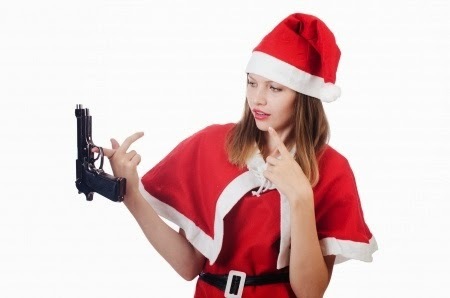 Carmen DeSousa: A new man, a new life, and a gun for Christmas. My real-life fairy-tale Christmas. A new man, a new life, and a gun for Christmas. My real-life fairy-tale Christmas. I did have a ray of light in my life, though. I had wonderful grandparents and an Uncle and Aunt who were wonderful role models. Still, many years sitting at my cousins’ Christmases, made me long for the family I never had. So the weekend before Thanksgiving it wasn’t unusual for me to start feeling depressed. I was twenty-two, I’d been living on my own and dating the wrong men since I was seventeen, and my prospects weren’t looking good that I’d ever find my happily ever after. I’d prayed to God more nights than I could remember for Him to rescue me from the road I was travelling. And then, a funny thing happened. My roommate wanted me to go out partying on Saturday night. I’d refused repeatedly. I had a final on Monday, and if I didn’t pull my grade up, I’d get kicked out of college. Needless to say, I crumbled under peer pressure and her comment that I might meet “Mr. Right.” Humph! At a bar? I don’t think so. Well, we weren’t in the club two minutes when my friend ditched me—a regular occurrence. But as I’m standing in the doorway of the lounge, deciding whether to take my car and leave her, a man walks up. A man I’d met a couple of times since he was a friend of one of the losers I’d dated. In fact, I’d tried to hook him up with my friend. The man says to me, “Hey, where’s your friend?” He’d taken her number a few weeks ago but never called her. LOL! I was secretly glad. On December 1st, thirteen days later, this extremely interesting man, who was in the police academy to be a police officer, took me shopping to buy our first Christmas tree together. That night we went to a quaint Italian restaurant, and he asked me to marry him. Yes, you read correctly…thirteen days after our first “official” meeting. The week before Christmas, this man started his new career as a police officer, and for Christmas, he presented me with a Taurus .38 Special as a gift. Yes, I thought it was very romantic. And yes, he did get me other things, but that’s the gift I remember. He also bought me a diamond, but I made him take it back since we would need furniture for our new apartment he leased for us. We moved into the new apartment on December 30th and December 31st we eloped. We still kept the wedding plans for March 25th and remarried in front of our friends and family, though. This year on New Year’s Eve, we celebrate twenty-four years of marriage. Yes, I believe in fairy tales and Christmas wishes, because I’m living one. Merry Christmas, friends. Always remember to BELIEVE! Thank you for stopping by my place and reading my musings. Remember these are just my opinions and shouldn’t be taken too seriously. If you’re curious about what I write, please visit my author page, where you can read all about my novels and short stories. And hey, I’ll even give you a free book just for stopping by. Also, don't forget about the chance to win a $50 Amazon Gift Card. Enter to win simply by downloading one of my books and/or sharing the news! Ends 12/31/13!